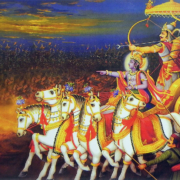 Srimad Bhagavatam is known as the “king of all spiritual books” (Grantha Raja) for good reason. Within this divinely immaculate, tri-guna-free, spiritual sastra, the amalapurana, one will find all the sweet, majestic and beautiful truths about the sadhana and sadhya (daily practices and final goal) of GaudiyaVaisnavism. In the most wonderful sastra, Sri CaitanyaCaritamrita, Sri Krishna DasaKaviraja has mercifully summarized the teachings of CaitanyaMahaprabhu and the six Goswamis of Vrindavana. To prove these truths, he cites key Bhagavata verses throughout his treatise, which the Goswamis themselves have also discussed in their voluminous works. To highlight its importance for all devotees of Sri Caitanyadeva and Radha-GovindaYugala, the same Bhagavatam verse is quoted once, twice or even four times in the Sri CaitanyaCaritamrta. With the grace of Sri Advaita Prabhu, Sri Guru and the Vaisnavas, the “Beautiful Truths of Bhagavata” series will focus on these Bhagavatam verses which clearly reveal the absolute truth about Sri Krishna, Sri Radha, Sri Guru, the Vaisnavas, Bhakti Sadhana, Sri Harinama and Krishna Prema. 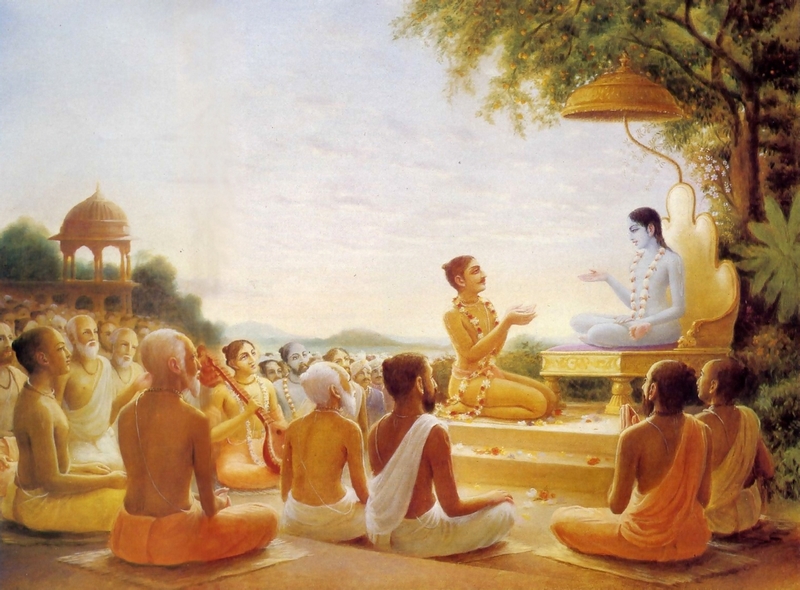 By citing key verses and selected commentaries, this post discusses the identify, power and uniquely supreme position of the SrimadBhagavatam, the crown jewel of all transcendental tomes. Sincere sadhakas should learn and reflect upon these verses. Absorbing, and implementing these truths will strengthen your faith, expand your joy, and double your enthusiasm to love, serve and respect all the humble servants of Sri SriRadha and Krishna. Srimad Bhagavatam Maha Purana ki jai! Why Bhagavata Is the Best Scripture? “Bhagavan Sri Krishna becomes immediately captured in the heart of anyone who hears the Srimad Bhagavatam. This does not happen with other spiritual books. The Bhāgavatam alone, manifested by the Sri Krishna Himself, presents the true and permanent objective of human life which can be understood by unselfish persons. By illustrating what is beneficial and unbeneficial for the jīva, the Bhagavata gives bliss to all the listeners and enables everyone to fully achieve the highest objective of human life. Simply by hearing/reading the Bhagavata, Sri Krishna (īśvaraḥ), the shelter of everything, is immediately captured (avarudhyate) in one’s heart. Even without faith, as soon as one hears Bhagavata, Sri Krishna enters the heart. Besides that, Sri Krishna becomes very happy and filled with prema when one hears the Bhagavata. Repetition of the Sanskrit word atra (line 1 & 3) stresses that this benefit is not attained by any other scripture or other spiritual practice (kiṁ –vā- paraiḥ). What happens when one understands the teachings of the Bhagavata? It gives the topmost auspiciousness (śivadam) by making one an eternal premibhakta of Bhagavan Sri Krishna, and liberating one from the material world. Sri VisvanathaCakravartipadaki jai! Srimad Bhagavatam ki jai! Śrīmad-Bhāgavatam is accepted as the essence of all Vedanta. One who experiences satisfaction from tasting the nectar sweet rasas of the Bhagavata is never attracted to any other literature. (6) Manvantara: Conduct of the Manus. (7) Iśānukathā: Lilas of Bhagavan’s various descents. (8) Nirodha: Destruction of the universe. (10) Āśraya: Shelter of Bhagavan Sri Krishna. If someone says, ‘Alas! Alas! 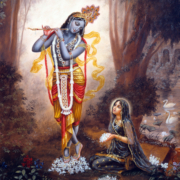 What misfortune that Krishna did not continue to manifest His intimate pastimes down to the present time.’ To console such persons, Suka Muni composed this beautiful verse to conclude Krishna’s lilas. The phrase jana-nivasa means that Syamasundara Sri Krishna and all His intimate associates in nara-lila are living right now on the earth planet. The word jayati, “Krishna is eternally victorious”, is in present tense, which means that Sri Krishna is eternally present in the divine dhama of Vrndavana; in His divine names; and in the recitation of His glories. The phrase kāma-devam means that Krishna is the brilliantly effulgent transcendental embodiment of spiritual desire and amorous love. With His blissful smiling face Sri Krishna forever increases the divine amorous desires (vardhayan- kāma-devam) of the damsels of Vraja and the cultured ladies of Mathurā and Dvārakā, who are completely attracted to Krishna. Thus, with this verse, Suka Muni establishes that all of Krishna’s lilas described in the Tenth Canto i.e. Vraja, Mathurā and Dvārakā are all eternal! Srimad Bhagavatam ki jai! Seeing Krishna lilas with prema locana ki jai! Jai Jai Sri Radhe! Beautiful Truths of Bhagavata 002 Self-Realization Means What?